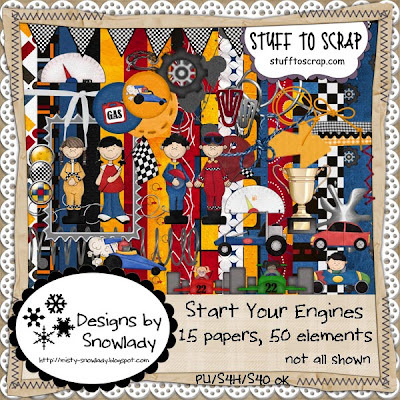 I had the pleasure this month to work with Start Your Engines from Designs by Snowlady. The colors are so bright and fun, and the elements are adorable. I have many pictures I could've chose to work with but since Stuff to Scrap was having various Labor Day challenges, I knew exactly which ones would work best. Here's a look at the kit...fun, huh? First up, there was a Slow Scrap this weekend with two steps given each day (Friday through Monday). Luckily, it was a SLOW scrap because the steps were challenging and detailed. I love how mine turned out though. 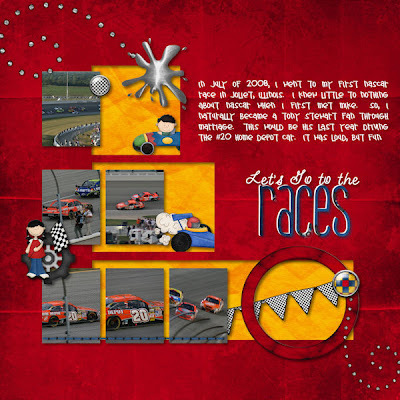 I scrapped pictures of my first NASCAR race in 2008. There was also an Inspirational Challenge. We were given this picture. From it, we were to design a layout. 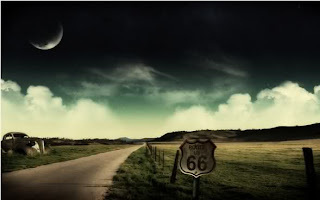 My eyes were immediately drawn to the Route 66 sign, and I knew right away what pictures would work best. Cars! What else!! I still had these pictures to scrap from our trip to Hollywood Studios at Disney World for our honeymoon. I snagged this fun template from Little Green Frog Designs and went to town with this fun kit. 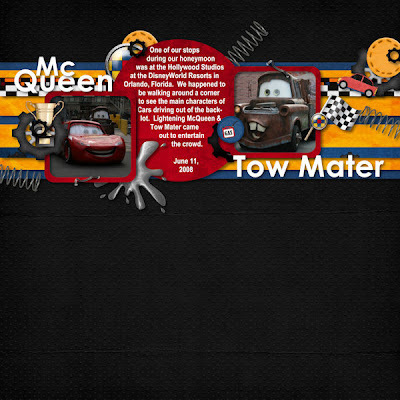 It works so well with these pictures of Lightening McQueen and Tow Mater. Go grab the kit now...she's the featured designer this week at Stuff to Scrap, so her whole store is 50% off.